Siddal have crunch home matches against top-of-table rivals Wath Brow Hornets and Leigh Miners Rangers over the next two Saturdays. 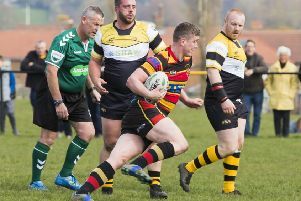 They will be keen to get back to winning ways against the Cumbrians next weekend after their unbeaten start to the National Conference League season was ended at Wigan St Patricks in their latest outing. Saints edged a 26-24 victory last Saturday but Siddal remain top of the Premier Division on points difference from Miners, who beat visitors West Hull 36-4. Wath Brow won 30-0 at Lock Lane and are third. Siddal trailed 16-12 at half time at Clarington Park and the difference at the end was one goal kick. Both sides scored four tries but Saints’ Daniel Birkett landed five goals to Fred Walker’s four. The two fullbacks were their sides’ star performers. Stand off Shaun Garrod scored his seventh try of the season for the visitors and forwards Jason Boults, Canaan Smithies and Ross White got the others. Backs John McCoy, Declan McLoughlin and Tyler Spence and replacement Kieron Harrison touched down for the hosts. Elland slipped to the foot of Division One when they lost 55-4 at home to Featherstone Lions after trailing 24-0 at the break. They had a solitary try from Liam Manning to show for their efforts while another replacement, Luke Leonard, was their best player. The Lions backs ran riot, scoring seven of their side’s 10 tries, scrum half Ian Jackson landing seven goals and a drop goal. Elland were overtaken by Millom, who picked up their first win of the season with a 20-18 home success against Normanton Knights. Things do not get any easier for Elland, who travel to Thatto Heath on Saturday. The St Helens outfit won 28-4 at Hunslet Warriors at the weekend and are second in the table.